Signal transducing adaptor proteins are proteins that are accessory to main proteins in a signal transduction pathway. Adaptor proteins contain a variety of protein-binding modules that link protein-binding partners together and facilitate the creation of larger signaling complexes. These proteins tend to lack any intrinsic enzymatic activity themselves but instead mediate specific protein–protein interactions that drive the formation of protein complexes. 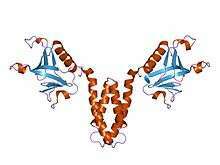 Examples of adaptor proteins include MyD88, Grb2 and SHC1. Much of the specificity of signal transduction depends on the recruitment of several signalling components such as protein kinases and G-protein GTPases into short lived active complexes in response to an activating signal such as a growth factor binding to its receptor. Adaptor proteins usually contain several domains within their structure (e.g., Src homology 2 (SH2) and SH3 domains) that allow specific interactions with several other specific proteins. SH2 domains recognise specific amino acid sequences within proteins containing phosphotyrosine residues and SH3 domains recognise proline-rich sequences within specific peptide sequence contexts of proteins. There are many other types of interaction domains found within adaptor and other signalling proteins that allow a rich diversity of specific and coordinated protein–protein interactions to occur within the cell during signal transduction. TAB2 is an adaptor protein involved in the IL-1 signal transduction pathway: Takaesu, Giichi; Kishida, Satoshi; Hiyama, Atsushi; Yamaguchi, Kyoko; Shibuya, Hiroshi; Irie, Kenji; Ninomiya-Tsuji, Jun; Matsumoto, Kunihiro (2000). "TAB2, a Novel Adaptor Protein, Mediates Activation of TAK1 MAPKKK by Linking TAK1 to TRAF6 in the IL-1 Signal Transduction Pathway". Molecular Cell. 5 (4): 649–658. doi:10.1016/S1097-2765(00)80244-0. ISSN 1097-2765. PMID 10882101. Good article about adaptor proteins involved in protein kinase C-mediated signal transduction: Schechtman D, Mochly-Rosen D (October 2001). "Adaptor proteins in protein kinase C-mediated signal transduction". Oncogene. 20 (44): 6339–47. doi:10.1038/sj.onc.1204778. PMID 11607837. Retrieved 2012-09-05. A good article regarding the role of adaptor proteins involved with the T-cell antigen receptor: Samelson, Lawrence E. (2002). "SIGNALTRANSDUCTIONMEDIATED BY THET CELLANTIGENRECEPTOR: The Role of Adapter Proteins*". Annual Review of Immunology. 20 (1): 371–394. doi:10.1146/annurev.immunol.20.092601.111357. ISSN 0732-0582. Signalling discussed with regards to adaptor proteins: Pawson, T. (1997). "Signaling Through Scaffold, Anchoring, and Adaptor Proteins". Science. 278 (5346): 2075–2080. doi:10.1126/science.278.5346.2075. ISSN 0036-8075.